John Langan's second collection of horror and weird fiction has some of the author's most renowned short fiction and was celebrated by critics and readers alike. Previously only offered in ebook and paperback formats, Dark Regions Press is bringing the first signed limited edition of the book to Langan fans with a brand new story entitled "A Partial List of Monsters, Scenes, and Adverbs That Will Not Appear in My Next Story" by the author exclusive to this edition, the original wraparound painting by artist Santiago Caruso, a new afterword and much more. 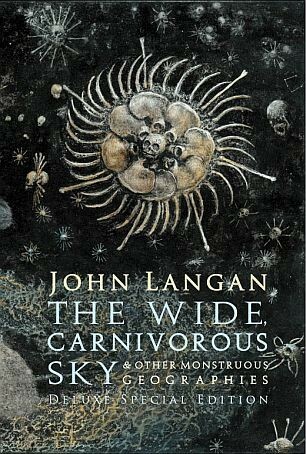 The Wide, Carnivorous Sky and Other Monstrous Geographies by John Langan Deluxe Special Edition is limited to just 52 signed and lettered copies worldwide, printed in an oversized 7"x10" format, bound in leather and housed in a premium slipcase. Featuring a high quality dust jacket, satin book ribbon and the original wraparound color artwork by Santiago Caruso as illustrated end sheets, the book is signed by author John Langan, afterword writer Laird Barron, introduction writer Jeffrey Ford and cover artist Santiago Caruso.